Occupy Boston protesters have been camping in Dewey Square near South Station for more than two months. Massachusetts residents are starkly divided over the Occupy movement, splitting along political, economic, and geographic lines, according to a new Suffolk University/Boston Globe poll. The survey found that 41 percent approved of the movement, 38 percent disapproved, and 21 percent were undecided or would not answer the question. Though the survey did not ask residents directly about their party affiliation, it found a strong correlation between support for the Occupy movement and approval of President Obama’s handling of the economy. Forty-six percent approved of the president’s economic policies, 42 percent disapproved. The poll of 400 Bay State residents was conducted last week. It has a margin of error of plus or minus 4.9 percentage points. The Occupy movement began in September, when protesters took over Zuccotti Park in New York City’s financial district to protest corporate power, the influence of Wall Street, and growing stratification of wealth in the country. Similar tent cities soon sprouted in cities around the world, including Boston, where protesters have been camped in Dewey Square, across from the Federal Reserve Bank of Boston, for more than two months. Most of the protests have been relatively peaceful, but have caused friction with neighbors. 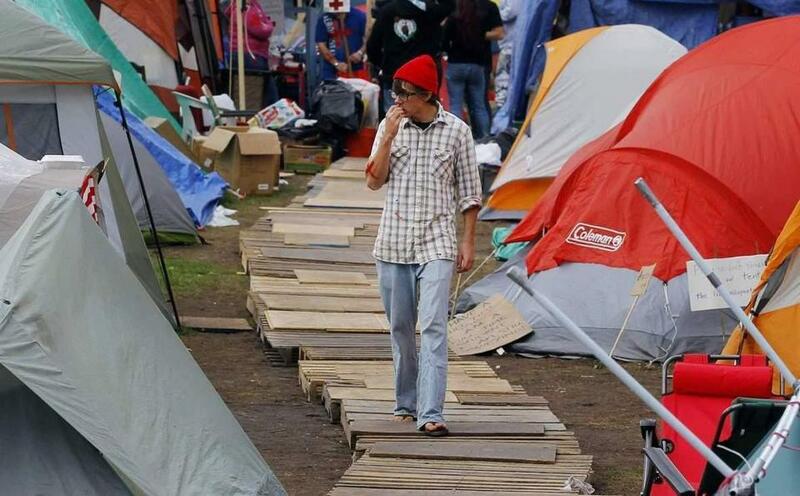 Many cities have complained the encampments have become health hazards and sought to evict protesters. Mayor Thomas M. Menino of Boston has said he does not have immediate plans to evict the protesters, but his administration has asked a Suffolk Superior Court judge to lift a temporary court order barring the city from doing so. Jill O’Loughlin, a 47-year-old crossing guard from Norwell, said the Occupy protests have largely had a positive impact, encouraging people to focus on issues such as the role of the financial sector in the financial crisis. But Peter Bekarian, 43, a commercial real estate broker, said he has a negative view of the protests because they do not seem to have clear objectives. As with Bekarian and O’Loughlin, the women polled were generally more sympathetic to the movement than men. About 44 percent of women expressed approval, compared with 37 percent of men. About 53 percent of residents in Suffolk County (comprising Boston primarily) said they approved of the movement, compared with just 35 percent in Southeastern Massachusetts. Overall, the movement had more support in Massachusetts, known for its liberal leanings, than the nation as a whole. A Quinnipiac University survey last month found that only 29 percent of American voters polled had a favorable opinion of the Occupy movement, about the same percentage that had a positive impression of the Tea Party. Only 23 percent of blacks interviewed expressed disapproval with the movement, compared with 40 percent of whites and Hispanics. Just 25 percent of renters frowned on the movement, compared with 41 percent of homeowners. Only 28 percent of unemployed workers expressed disapproval, compared with 41 percent of full-time employees. Ariel Oshinsky, a spokeswoman for Occupy Boston, said the movement transcends ideological and political lines. It has attracted conservatives, unhappy with corporate subsidies, as well as liberals worried about the growing concentration of wealth. Oshinsky said she was not discouraged that so many have negative opinions of the movement. She said it is more important that it has sparked debate on the economy and other issues. But as the protest drags on, views of Occupy Boston may be changing. Claire Cheevers, 61, an employee benefits manager from Shrewsbury, said she was initially sympathetic, but now believes the occupations have become counterproductive. They are generating some negative headlines, she said, and forcing cities to spend money on police overtime and other expenses - money that could be used instead for programs that could help the poor, unemployed, and others.